A man stands three feet from a sign which says, "do not feed the squirrels" on the Bright Angel Trail in the Grand Canyon. Inevitably, he is feeding the squirrels. A hiker stops and chastises him for feeding the wildlife. The man ignores the hiker and continues to feed the squirrels. There is a near traffic-jam on the Red Rock Canyon Scenic Drive. Someone is feeding the wild burros. Nobody can get by. The burros are congregating on the road. When confronted, the individual snorts and continues to feed the animals. As the snowboarders clip their boards to the top of the car, a group of gray jays begin to dive bomb them. The birds stop doing this once they feed them. Suddenly, the birds are more than willing to sit on a person's finger for food. A skier tells them that this is bad for the birds, but they ignore him and continue to feed them. The concept of Leave No Trace includes seven principals for wilderness users. These have been designed so that visitors leave as little impact as possible on wilderness recreation areas. The sixth principal of Leave No Trace is "Respect Wildlife." Feeding the wildlife is very bad. It's bad for the animals. It's bad for the wilderness. And it's bad for the people feeding the animals. There are two types of activities that lead to animal consumption of human food. The first is unintentional and the second is intentional. We often feed the wildlife in an unintentional way. This primarily happens when one is camping or climbing and accidentally leaves micro-trash. This is primarily in the form of crumbs or other food scraps. It is very important that wilderness users do a thorough check of any area where they eat in order to avoid this. 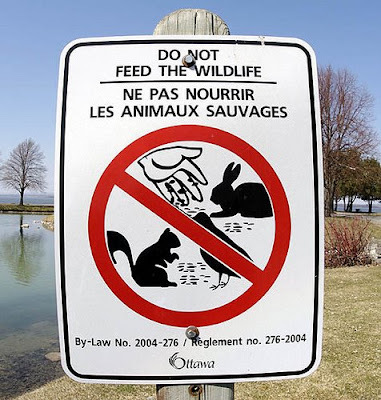 A far more disturbing and disruptive practice is the intentional feeding of wildlife. This is significantly more destructive because the volume of food tends to be higher and in heavily used areas, so is the frequency of the feeding. Most climbers and backcountry users understand this. The difficulty is not with them. Instead, it's with educating a general public that doesn't see a difference between feeding a wild animal and feeding a pet that's begging for food. It's strange that even when a person has been told they're hurting an animal, they're still not willing to change their own behavior. It's likely that they simply don't believe or understand that they're actually hurting the animal. They see a hungry creature and feel entitled to feed it. This is an incredibly hard trend to curb. The best way that we as climbers can help to change these perspectives is to model good behavior. It's best not to lecture people when they're engaged in this harmful activity, but instead to educate. The more you act like a know-it-all, the more likely it is that they will continue their activity. The more that you act like a knowledgeable wilderness user that is trying to impart information in a non-confrontational way, the more people will be receptive to it. Sometimes it feels like we're losing the LNT battle with those that feed the wildlife. But we cannot give up. Education is the best way to bring about change.